Amazing! 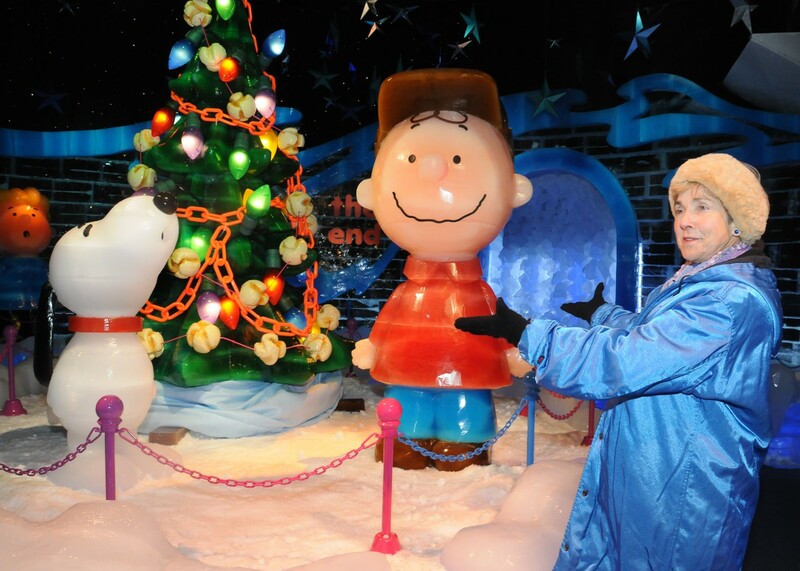 Just got back from a sneak peak at “Ice: A Charlie Brown Christmas” with Charles M. Schulz’ family – his wife, Jeannie Schulz, son Craig, Daughter Jill, and the producer of “Charlie Brown Christmas” and the other Peanuts television specials, Lee Mendelson. I had seen the ice carvers from Harbin, China, as they were just three days into a 40-day process that turned two million pounds of ice into eight scenes (you can see pictures at an earlier blog). To see it now, this amazing cartoon world come to “life” in ice, is indescribable. 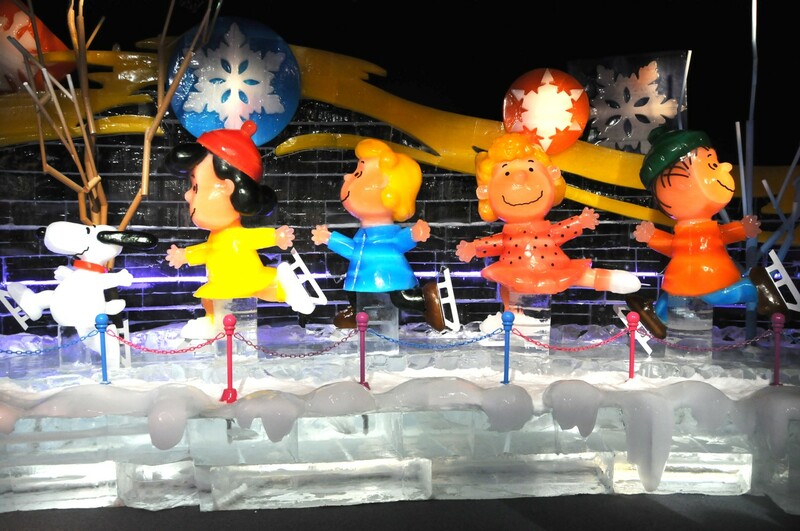 We are all given special parkas before we enter this 9-degree “world”, and are immediately dazzled by life-sized, colorful, three-dimensional re-creations of the Peanuts characters. It is as if they had come to life, in ice. Jeannie Shulz, Charles’ wife from 1965 until he died, was most moved to the last room where Charlie Brown, Snoopy and the Christmas tree are surrounded by all the Peanuts characters, as you hear them singing, “Hark the Angels Sing”. Most amazing, and fun for all, is this enormous room with four ice slides that you get to come down. Jeannie Schulz did it. So did Snoopy and Charlie Brown. 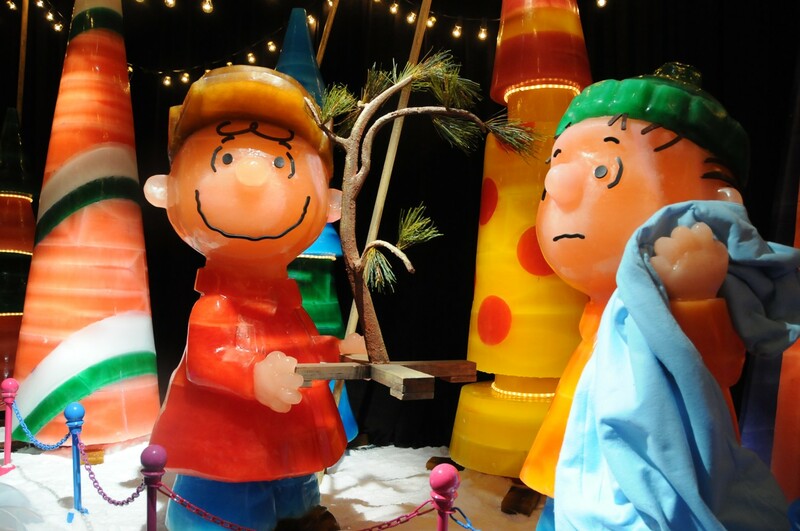 You will be dazzled by how the famous scenes from the 1965 television classic, from the first scene on the ice-skating pond to the transformation of Charlie Brown’s tree are transformed into three dimensions. The figures are five feet tall, fully formed and with all their color and nuanced expression, not to mention the incredible details in the wood flooring, leaves on trees, wreaths, streetlamp all made of ice – artistic marvels. It is uncanny, indescribable in words or pictures. It is magical. An icy wonderland. 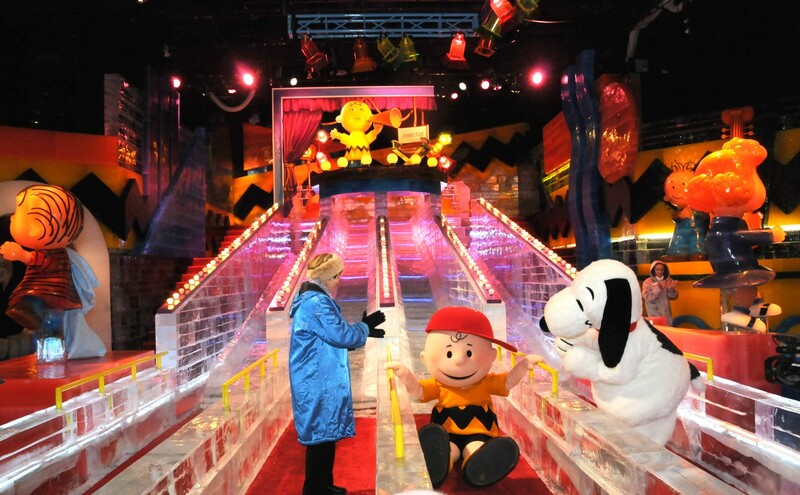 Jeannie, as well as Charlie Brown and Snoopy also went down the ice slide in another room that is jaw-dropping awesome. This is a phenomenon that must be seen, but it is only one element of Gaylord Opryland’s “A Country Christmas”. Other key attractions include the RadioCity Christmas Spectacular starring world-famous Radio City Rockettes; Louise Mandrell’s ‘Joy to the World’ Christmas Dinner & Show; and General Jackson showboat. Ice is on view daily, from Nov. 20, 2009 through Jan. 2, 2010, from 10 a.m. to 10 p.m. depending on the day of the week. Ticket prices range from $13 (child) to $24 (adult), depending on the day. Children ages 3 and under are admitted free. Two-night package at Gaylord Opryland Resort featuring room, ticket to Radio City Christmas Spectacular, Ice, Louise Mandrell, starts at $339 pp/double. 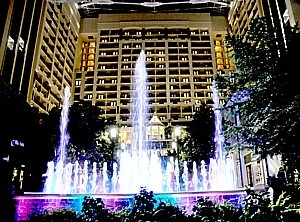 For info, go to ChristmasAtGaylordOpryland.com or call 888-OPRY-872. More complete story, photos at http://www.travelwritersmagazine.com/TravelFeaturesSyndicate.